I thought the synopsis of The 57 Bus was interesting, but the way it is written was totally not me and I was annoyed for most of the time. 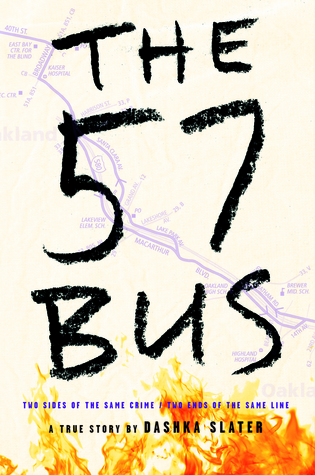 I give The 57 Bus by Dashka Slater two out of five hearts because I really disliked the way the story is told. I was disappointed with it because I really wanted to read this book because of its synopsis. The story is filled with exposition and felt more like a study of what happened on that bus than anything else. It is literally explained what the difference is between all the different sexual orientations and I know that in the culture today it is important to make that distinction and also for the story, but I do think that by now people have been thrown around their heads with them and they should already know otherwise they wouldn’t even read this book. Also, not all the sexual orientations are important for the story. I do think that what happened to Sasha and Richard is horrible, but I also think writing a nonfiction book about these two isn’t necessary. These two teenagers should be left in peace and given the space they need to recover from these events. Overall I wished it had been a fiction book and written that way because I really disliked this book. But unfortunately it wasn’t and it is this mess. It doesn’t make me very interesting to read anything else by Dashka Slater, even her children’s books. This entry was posted in Book Review and tagged Book Review, Crime, Dashka Slater, Drama, LGBT, Nonfiction. Bookmark the permalink.